The blandness of this Politico story, titled “Two more officials cited in FBI texts step down,” conceals really, really big news. The jig is up. Each of the “officials” who is “stepping down” is leaving under duress and likely facing serious legal consequences for acts that have been disclosed – acts that go to the heart of the fraudulent application for the Page FISA warrant and the obstruction of justice in the Hillary email probe. “David Laufman resignation is a big deal. As [d]ep. [a]ssist. [A.G.] for National Security Division, he was the [p]rimary [s]upervisor over [c]ounter-[i]ntelligence work in Nat Sec. He would have had a hand in the approval of the FISA application on Page. “He likely had a role in the decision[-]making on the Clinton email investigation since his section handled cases involving leaks of classified information. The decisions on granting immunity, and allowing conditions to be attached to the examination of computers, would have come from his office. I do not think those were conditions that the FBI would have wanted. On the immunity issue, FBI wouldn’t have the authority – that could … come from [only] the prosecutors in Nat Sec. “The press reporting is that he offered his resignation yesterday, effective IMMEDIATELY. “That’s what happens when you are told that your are the subject of an OPR or OIG investigation. This source isn’t perfect. None [is]. But very, very accurate over many years. “Jim[,”] aka James Baker (FBI [c]hief [l]egal [c]ounsel)[,] was removed in January. “Mike[,]” aka Michael Kortan (FBI [a]sst. [d]irector [p]ublic [a]ffairs)[,] quits today. “Dave[,]” aka David Laufman (DOJ – National Security Division, [d]eputy [a]sst. [a]ttorney [g]eneral in charge of counterintelligence)[,] quit yesterday. Essentially, Sundance unravels the conspiracy to suppress evidence from the public prior to the election. 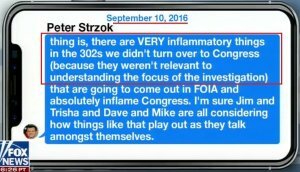 If you want to be ahead of the game in understanding who did what in the FBI conspiracy to fix the election, and when the “insurance policy” had to come into effect, this post, also linked above, is essential reading, with its organization charts, timelines, and contextual information. TLB published this article by Thomas Lifson from American Thinker. Our thanks to Mr. Lifson and American Thinker for making this perspective available for publication.